President Kim Yong-hwan of Korea Eximbank said at his inaugural ceremony on Feb. 7 in the bank’s auditorium that he will run the bank to strengthen its global cooperation system with Korean firms to secure projects overseas, which are growing larger in scale. To cope with tougher competition among similar Korean firms including Korea Policy Finance Corp. and Korea Trade Insurance Corp., he said the EXIM bank should do more to step up its cooperation with Korean firms in securing large overseas projects. His statement has been taken as meaning that the EXIM bank should play a key role in financing $10 billion to meet the cost of the nuclear power plants that Korean firms are set to build in the United Arab Emirates. The new CEO also said the EXIM bank should do all it can to turn itself around to become the bank leading green growth industries in the area of finance. He stressed he will try to come up with a “green pioneer” program to nurture green export firms. Kim said he will also see that the bank continues to search for businesses with super potential ― about 100 of them this year ― and support their further development. Kim is a graduate of Seoul High School and Sungkyunkwan University in Seoul and passed the 23rd High-level State Exam to enter public service. He worked at the Ministry of Finance and rose through the ranks, ending his government service as senior vice-chairman of the Financial Services Commission. The government established the Economic Development Cooperation Fund (EDCF) on June 1, 187 with the purpose of promoting economic cooperation between Korea and developing countries. Drawing on Korea’s own development experiences over the years, the EDCF assists partner countries by providing funding for their industrial development and economic stability. The highest policy-making authority of the EDCF is the Fund Management Council, which is composed of 12 members, most of whom are minister-level government officials. The direction of EDCF operations and the assumption of principal policy-making responsibilities rest with the Ministry of Strategy and Finance (MOSF), which also coordinates policy matters with other relevant ministries. Entrusted by the MOSF, EXIM is responsible for the administrative operation of the EDCF, including appraisal of projects, execution of loan agreements and loan disbursements. Other duties include principal/interest payment collection, project supervision and ex-post evaluation of project operations. In the bilateral assistance programs, implementing large-scale program aid is difficult on a limited budget. Instead, EDCF is concentrating on capacity building of partner countries, with the goal of helping them achieve self-reliance. For this purpose, the main areas of assistance are human resources and economic infrastructure. Specifically in the area of human resources development, Korea has committed not only to providing educational equipment for developing countries, but also to sharing the lessons it has learned from decades of development experience through operating various trainee and expert exchange programs. In terms of economic infrastructure assistance, among other fields, EDCF has emphasized the importance of reducing the “digital divide” by seeking ways to assist partner countries in their development of the information technology (IT) industry. In this sector, there is more room for participation by innovative small and medium-sized enterprises. 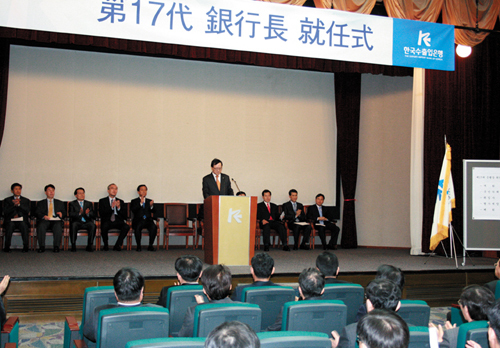 (left) Chairman and President Kim Yong-hwan of Korea Eximbank gives a speech at his inaugural ceremony held on Feb. 7 at the bank’s auditorium. 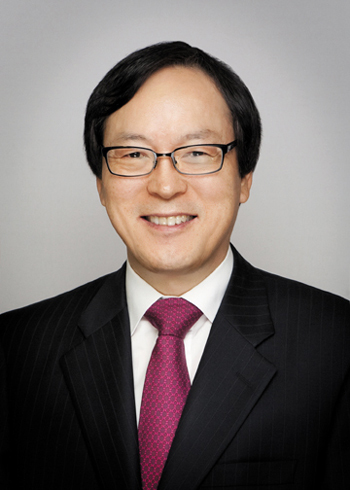 Korea Eximbank President Kim.